What is special about www.kashmir123.com? 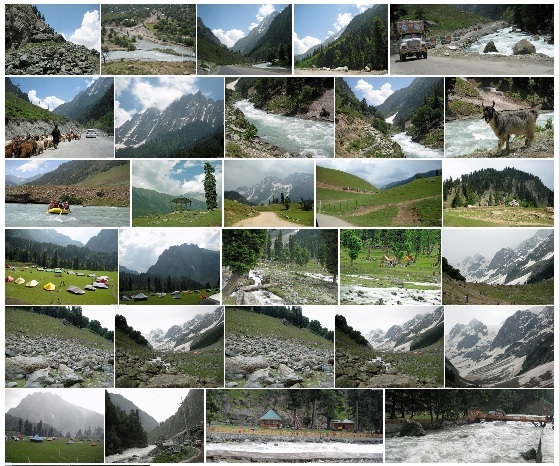 This video shows the beautiful natural scenery & landscape of Sonamarg, a hill-station in Kashmir Valley. It is a very calm, quiet and uncrowded place, located about 54 miles (87 kilometers) away from Srinagar (the summer capital of Jammu and Kashmir). It has an elevation of 9,200 feet (2,800 meters), a pristine landscape, and gorgeous natural scenery. Some of its mountains are covered with snow throughout the year. The Thajiwas Glacier, located in its mountains, attracts tourists in summer. Sonamarg is also known as "The Meadow of Gold," probably because of its wild, yellow crocus flowers that bloom in spring. Some of its most attractive features are green pastures, wild flowers, snow covered mountains, mountain lakes, forests, and the Sind River (aka Sindh Nallah) with its rocky beds. Due to heavy snowfall, avalanches, and a harsh, cold climate, this Himalayan valley is almost inaccessible during winters. This video shows what the place looks like in summer. It is dubbed with Pachelbel's, "Canon in D Major." Please do share and comment. This video is hereby released under the Creative Commons Attribution 3.0 (CC BY 3.0) license: You may freely share and reuse this video for any purpose you want, provided you give credits to www.kashmir123.com for the video, and to Kevin MacLeod for its music (if you reuse it with the same music). Thanks for watching. Videos shot by a highly unprofessional videographer along the Pahalgam-Chandanwari road in Kashmir.